The sheep fleece derives from the Made-well farm in Hatherleigh, Devon. North country mules create our suffolk cross texels, which provide us with such wonderful fleece to make things with! This fleece has been washed and scoured, then dried. 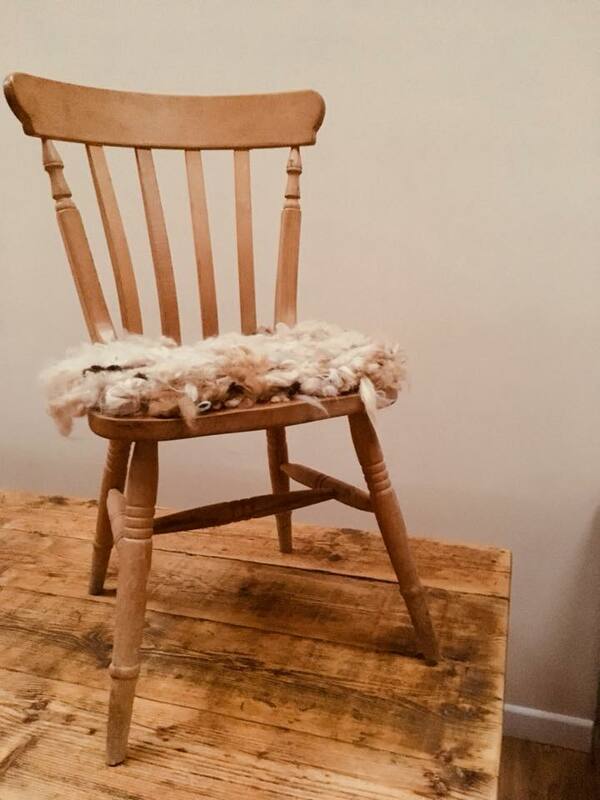 It has been woven together using a traditional peg loom and finished off with some tiebacks, to fit any dining chair. It provides comfort for the bottom on a county-kitchen dining chair. Ideal for wooden chairs. Available in a variety of natural colours and made to order for size and fit. We can make matching seat pads for a set of four, for example. This lamp has been made by using completely recycled materials. 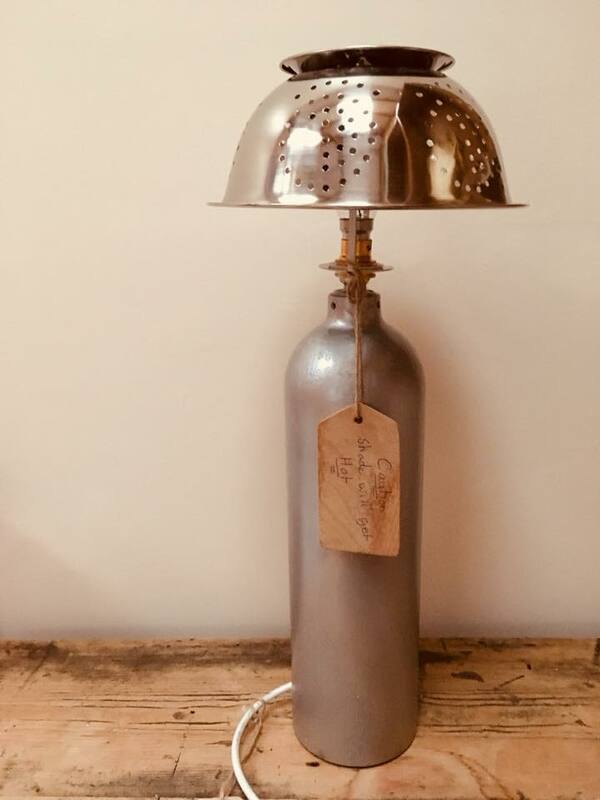 The extinguisher is used as the base, with full electrics fitted, and a novel shade is made using the colander. It shines a beautiful light into any room, creating warmth with a stylish look too! 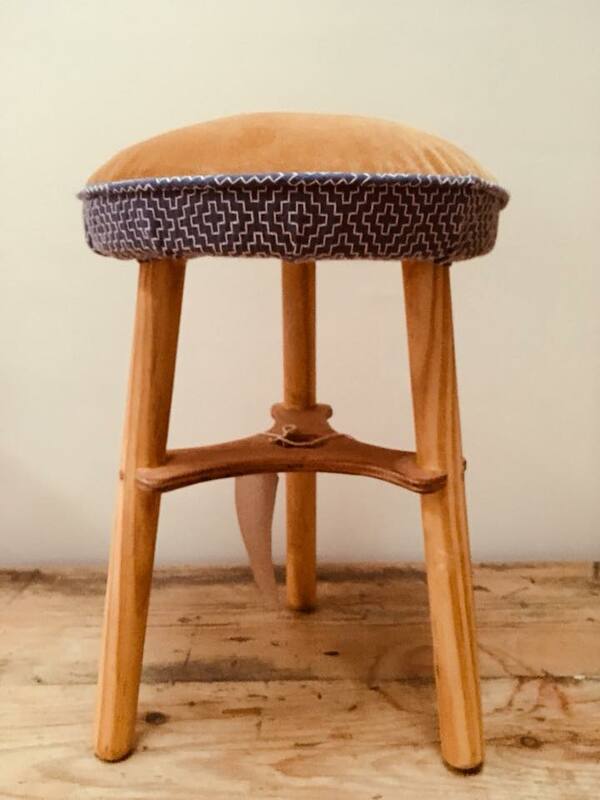 This milking stool was made by our members and guided by our in-house upholstery teacher and carpenter. The stool started life as a broom handle, some pallet wood and plywood. The seat was biscuited together from pallets and sanded to perfection and the brace made out of plywood and shaped just right to fit the legs – with the exact angles. In the upholstery, hessian, horsehair and wadding was added to stuff, then calico and the top fabric. The top fabric was chosen by David and depicts woodland animals. It has a contrasting piping trim of geometric pattern. Perfect gift – ideal for a children’s room! 50cm high.